Every year one or more friends kindly congratulate me on January 5th when the Church celebrates the liturgical memorial of St. John Neumann. They mistake his name, pronounced Newman here in the United States, for Cardinal Newman. John Neumann, a Redemptorist priest who became the fourth bishop of Philadelphia was born in Germany (1811-1860). 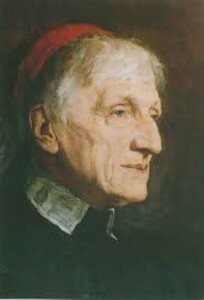 His name, which means “new man,” was German and thus pronounced differently than we do, but because of the English rendition people often think of Cardinal Newman (1801-1890). Besides their name, these two saints have a number of things in common. Cardinal Newman’s family name was probably similar to that of the German saint. Newman’s family name comes from the Low Countries although his family later settled in Cambridge and afterwards in London where Newman was born. Both saints lived during the 19th century and experienced some of the same difficulties faced by Catholic immigrants. Neumann ministered to Catholic immigrants to Philadelphia, and Newman to Irish Catholics in Birmingham. Both lived in large cities. When Neumann was bishop Philadelphia was possibly the second largest English speaking city in the world. Neumann organized the first parochial school system in the United States. During his short time as bishop – before his untimely death- two hundred schools were opened. Cardinal Newman for his part founded the Catholic University of Ireland and later the Oratory School at Birmingham. Although he only founded one school, the ideas and practices that he applied to education have had a lasting effect. Both men were holy priests who dedicated their lives to teach the faith and sanctify their fellow men through the administration of the sacraments. Raised to the altars the Church proposes them to us as role models for priests in the exercise of the priesthood. To all of us they are examples of living the virtues, especially faith, hope and charity. They show us what it means to be a “new man” through grace. Saint John Neumann and Blessed John Henry Newman, pray for us! This is a good article and needed …. the two are so often confused! Well explained … thank you. Funny thing but I hear that alot, as well. I knew of St. John Neumann much sooner since I grew up in the Philadelphia Archdiocese – have a family member who saw the results of one of his miracles. I used to make the same mistake, and thought Newman Clubs were Neumann Clubs. Thanks to you, I have learned a lot more about the English gent with the same-sounding name, and now notice that the Bishop from Philly often gets overlooked by the giant scholar from Oxford. Dan, I meant to add in my blog post that I studied at St. Joseph’s Prep on Girard Ave, only two miles from the church where St. John Neumann is buried, located on Girard Ave. As you know it is a very peaceful place where one senses God’s presence.